That’s why I can’t play any more 😦 A thousand little quiet places I love have now become quest hubs for efficient levelling. I much preferred the old, difficult, annoying, impenetrable game, because although the game – the fun – was bad, the world had such lovely little corners. I suppose that’s just nostalgia, though. I totally know what you mean… Ashenvale used to feel really serene and beautiful (both the surroundings and the music). Now it really feels like a place of war… they even added two new musical themes that emphasize how torn apart the place is, it’s kind of sad. What were some of your favorite places? I really loved the coastal areas of Desolace, they had a lovely sort of windy beauty – similar to the Arathi Highlands. And The Barrens! I suppose it was because I was there when everything was new and a mystery, but I love the sense of baked-in heat, and the sizzling, hazy air. And the autumnal forests of Azshara! I also always found Ashenvale enchanting – when I first explored there I was such a low level that everything was terrifying, and that feeling has never left me. A place where it really feels wild 🙂 And yes, I always went to Zoram’gar on each character! I don’t really like the war-torn theme – Hellfire Peninsula, the areas around Blackrock, etc. I think I’m the same way, I really didn’t like the war-torn areas… we rushed through Hellfire Peninsula as quickly as we could so that we could move onto other areas (Nagrand was such a nice break from that). Wow. It sounds like they were very successful in translating the feel of a cataclysm to you, if they’ve managed to take away one of your favorite locations (but still give you tons of fun content). Still need to try this out. It sounds like they’ve actually made the game more my style, rather than just a bunch of grinding with a few interesting quests in between. I believe Mitsuwa has moved inland to Hellscream’s Watch. Thank-you for letting me know! I was so curious about what had happened to him! I’m very impressed with the levelling from 1 to 60, but less impressed with 80 to 85. Done 85 a couple of times now, and it’s getting quite old already. 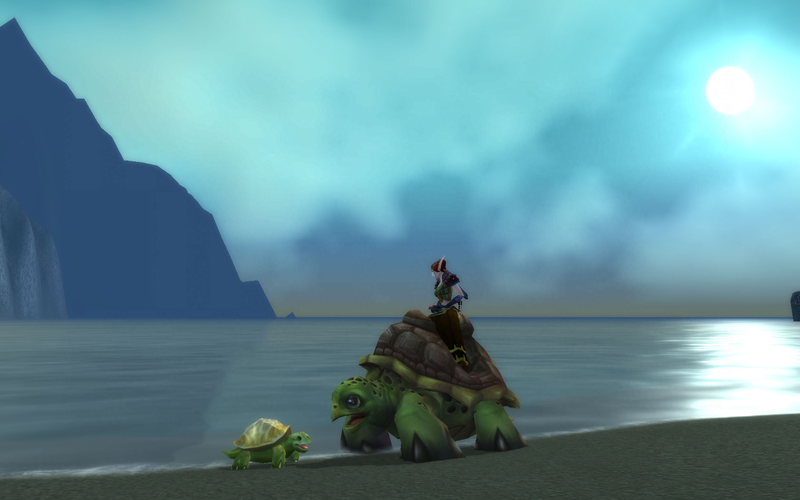 The things that made me sad were the drowned tortoises in the shimmering depths (shimmering flats as was), and the dead cows in the burnt-to-the-ground ruins of southshore 😦 Why did they hsve to kill the poor moo cows? I’ll let blizz off the hook though, cos I really enjoyed finding the critter war on the plateau north of Mulgore. There are axe wielding rabbits and gun-toting rodents fighting each other!